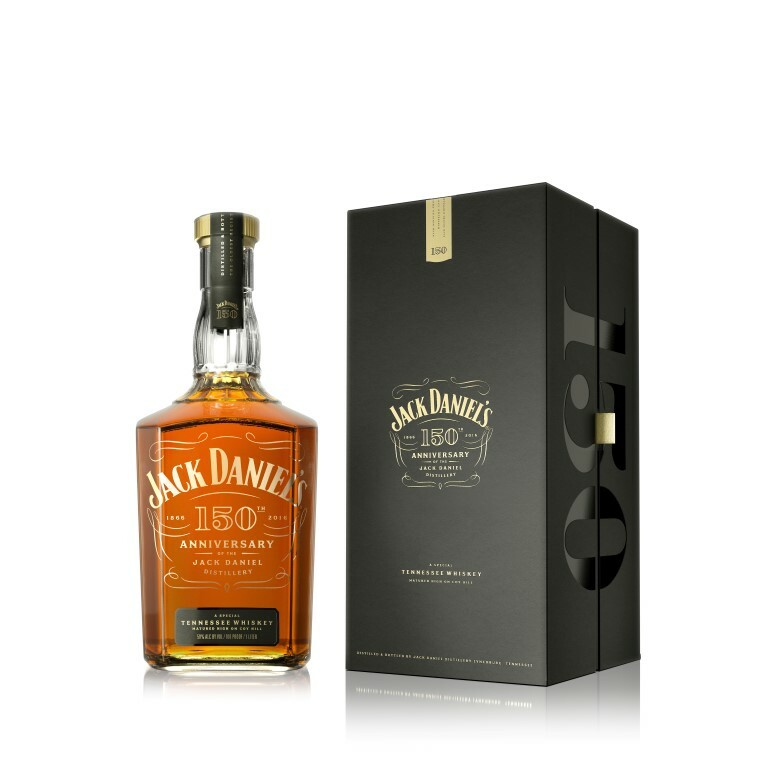 Tennessee’s iconic Jack Daniel’s is celebrating its 150th anniversary, and to celebrate the occasion it’s releasing a special edition of Old No. 7. Production on this release is the same, but JD offers some variations on how (or rather where) it was aged, and it’s bottled at 50% abv instead of 40%. No age statement is provided. True to the process established by its founder, the grain bill for the anniversary whiskey is the same as the iconic Jack Daniel’s Old No. 7, consisting of 80 percent corn, 12 percent barley and 8 percent rye. Each drop was then mellowed through ten feet of sugar maple charcoal, before going into specially-crafted new American oak barrels, adhering to the guidelines required of a Tennessee whiskey. Once filled, the barrels were placed in the “angel’s roost” of one of the oldest barrelhouses at the Distillery where whiskey has matured for generations at an elevation and with the exposure to sunlight that creates the perfect climate for the greatest interaction between the whiskey and barrel. The nose is an iconic example of (high proof) Tennessee whiskey, offering ample alcoholic heat, plus aromas of maple syrup, toasted marshmallow, and some barrel char notes. There might be a bit too much heat on the nose, so give it a a drop of water or, at least, some time in glass to help it showcase its wares. The palate isn’t nearly as racy as the nose would indicate, showing off a fruitier side of Jack, with notes of cinnamon-spiced apples, orange peel, and peaches. There’s ample vanilla, some chocolate-caramel notes, and a moderately dry finish that echoes the charred wood found on the nose. It doesn’t all come together quite perfectly, its tannic notes lingering a bit, but it’s an altogether impressive bottling from one of the biggest names in American whiskey. Best whiskey to date. I would put it up against any of the whiskeys I have tasted that cost 100 times more in price. The smoothness and aromatic blend taste puts this whiskey in a superior class of its own. This one really deserves a medal. Uncle Jack would be so proud of this masterpiece whiskey with his name on it and I know he is smiling down on everyone who helped bring the 150 Anniversary LE (100 proof) to us. Keep up the excellent work at the JD distillery.